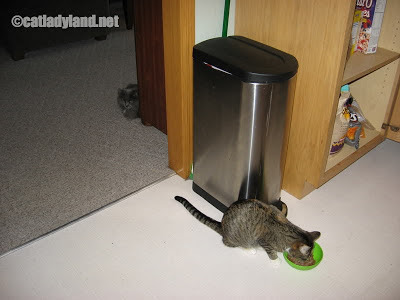 This is how it goes down at my house: Saffy inhales her food and then stalks Phoebe's dish. I do my best to distract Saff, but she always winds up creeping around the corner somewhere, waiting until I'm not looking so she can descend upon poor Pheebs. Look how stalkerish she looks.